I've been shooting timelapses seriously since 2011. I first started out of curiosity from watching other peoples work, mostly from the work of Tom Lowe on his film Timescapes, which is a stunning example of the best that timelapses can offer, and is a level that I hope to attain in my life. Also, for myself and I imagine many others, a timelapse sequence in recent years that has inspired my work, is the opening sequence for Netflix's 'House of Cards'. Since 2011 I have been practising and improving my understanding, skillset, and equipment involved in creating them. 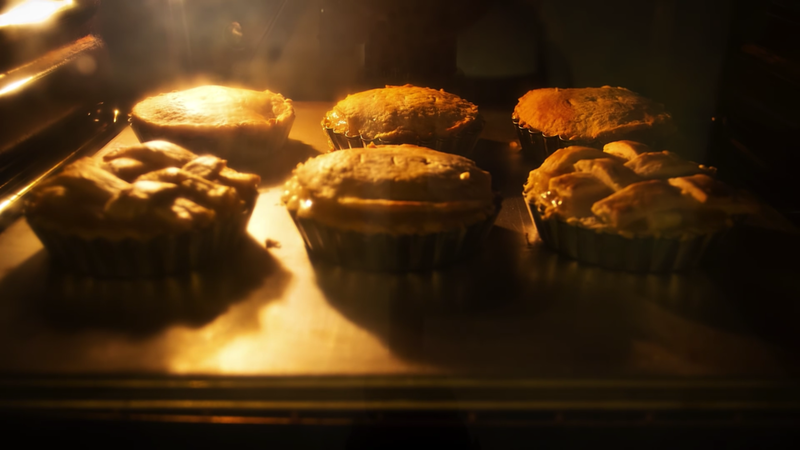 Initially I timelapsed anything I thought may look good: the view out of the flat window, a pie baking in the oven, fireworks; essentially everything to see what worked and what didn't…fireworks do not. There are two ways to create a timelapse, one technique is simple and yields reasonable results, and the other technique yields much greater results but requires far more knowledge, patience, camera equipment and post processing. The simplest and quickest way (popular amongst vloggers) is to record standard video for a period of time, on any video capture device (camera, phone, DSLR, GoPro etc), and speed it up in editing software: 2x speed, 5x speed, 10x speed etc. This is quick and easy, and probably gives the desired effect most of the time. However, it does not give much control and can look 'stuttery' due to the lack of motion/shutter blur - given that the camera is likely abiding by the 180 degree shutter rule when recording. Casey Neistat vlogs are a good example of this style, and so are the vlogs I cut for the YouTube series 'Siobhan and Emma Explore'. The effect is generally good enough and the majority of audience members won't see any problem with this style. It also has the flexibility to be used as regular footage. For example, if you plan to use it in a vlog, you could timelapse for 10 minutes, then pick the camera up and start talking to it, without a break in the media; this wouldn't work with a still image timelapse. The more advanced way to timelapse, is to shoot a series of still photographs with an interval between each one (1 sec, 2 sec, 5 sec, 30 sec, 10 minutes etc) you would then combine them into video in post-processing. This method gives the most flexibility, and arguably the best results, but can go wrong very easily, and requires a lot of practice to get right; as a single mistake could make the whole video useless, and require a re-shoot. With this method you do get to control every aspect: shutter speed, interval, aperture etc, and in my opinion this often vastly outweighs the negatives. This method also has downsides, such as storage space and the requirement for much more computer power to process the images. I would argue the still image method is generally the standard, and is used for all manner of professional timelapse purposes, whether that be over a 10 minute period of time, or for days, weeks, and longer. The still image method gives the timelapse artist total control over what the final outcome looks like; it just takes more planning and lots of practice. I think my first timelapse video was shot during University, when I shot a music video as part of a Bob Geldof music video competition. 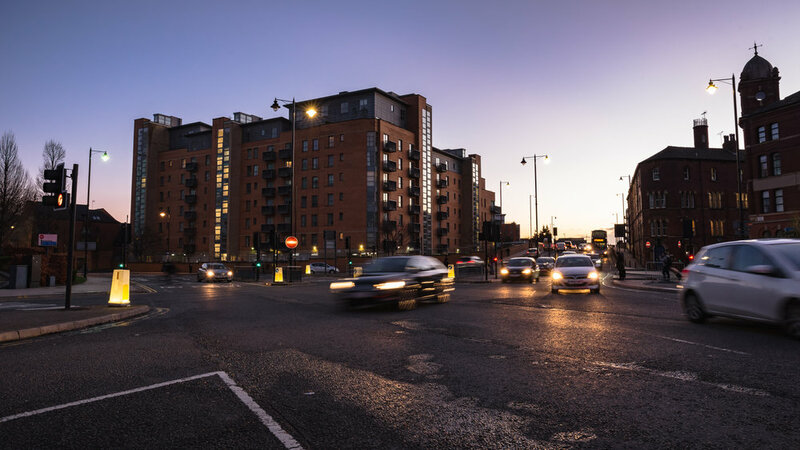 As a small team of three, we shot several timelapses around Manchester, in a very primitive way, manually clicking the shutter on my Nikon D3100, every few seconds, for several minutes at a time. The JPEGs from this were then loaded into Final Cut Pro 7 as single frames, and exported as ProRes media…I can promise you I have moved on from this. From there I started to look into pushing this skill further with RAW timelapses, this involves shooting RAW photos, colouring them, and converting them to video. 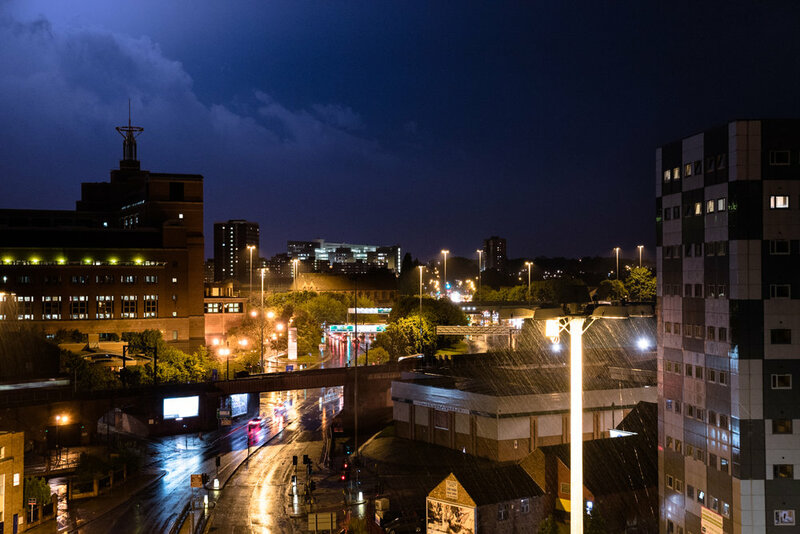 This first experiment ended in a short timelapse film of Manchester from the view of my flat at the time, it took quite a while with the kit and understanding I had, but it was a step. In terms of experimenting with RAW timelapses, it is fairly accessible as any DSLR (and now many phones, point and shoots, mirrorless cameras etc) shoot RAW images; however the post-processing will be slow with cheap computer kit. For example a low end DSLR will cost you around £300 (or less if you buy pre-owned), so it's not expensive to try. However, if you don’t feel comfortable working with RAW photography yet, you can always work with JPEGs at first, until you feel comfortable to try RAW. Over the years I have experimented with various methods of timelapsing, depending on the cameras and computer power I had available to me. Below are the different workflows I've tried. If you shoot a timelapse with JPEGs, open them as an image sequence in Quicktime 7 (NOT Quicktime 10), and export ProRes 422 HQ or ProRes 4444 media. This retains your image size (4k, 6k and above) if you choose, or you could downscale it to a more manageable frame size. The resulting ProRes files also retains your colour space, and will reduce CPU usage in edit; in comparison to editing with image sequences. You would then colour the footage in the edit, instead of as stills. This is a good method for just a few sequences and produces results quickly. As above you shoot a JPEG image sequence on your camera, but then load the images into a photo editing programme such as Adobe Lightroom or Capture One; colour the images in there, and export new JPEGs. Then continue with the image sequence in Quicktime 7 as above. As in method 1, this yields a result reasonably quickly, but arguably gives you more control over the colouring. An alternative version of the above JPEG routes, is to load the image sequences into After Effects (you could go via Lightroom first or not, it is up to you), and export them as ProRes from here. It yields the same results as the Quicktime 7 route, but After Effects can retain a history of your work, and you can also load up many sequences to export at once. This is a good way to convert several sequences into video, as After Effects is more powerful than Quicktime 7 and handles multiple sequences better than QT7 does. One method if using RAW images would be to use Adobe Bridge’s built in RAW editor 'Adobe RAW', to edit one file. Once done, sync these settings to all your images. You would then use these images as an Image Sequence in After Effects or Premiere. This method is fine but doesn’t give a lot of control in regards to the photo settings. However, it does give you the flexibility of either exporting video, or editing with the image sequences. A second way with RAW is to edit your images in their RAW format (Adobe RAW, Photoshop, Lightroom, Capture One etc) export them as JPEGs, then use the JPEGs as an Image Sequence or video file. This limits your colour space heavily (RAW could be 14-bit and upwards, JPEG is only 8-bit) but once the images are exported as JPEGs it is less CPU intensive. This method is defeatist, as you've reduced your colour information massively due to the JPEG export, and one big reason for shooting RAW in the first place is the colour depth. However you could come back to the RAW in the future, if you wanted to improve the sequences. As with RAW method 2, colour your RAW images in an image editor, then export ProRes media in After Effects to retain more of your colour space; ProRes 422 HQ would work, but I personally would choose ProRes 4444 or ProRes XQ. This would give you a good mix of retaining colour space, and speeding up your edit time. An ultimate way to retain all your colour space information would be to colour your RAW images in your image editor, then produce your edit with the image sequences in your NLE of choice. However, this would require some serious computer firepower, so I'd not recommend this for anyone new to timelapsing, or anyone without an incredibly powerful computer. Over time I have used various methods to find what works for me, whilst also working out what would be the most efficient method too; I use RAW Method 3 most often. You will often find you have to adapt and change workflows for different projects, depending on what options you have. For example, if you are shooting stills on a GoPro, this would mean working with JPEGs regardless. DSLRs would allow you to utilise RAW or JPEG. And using a phone would likely mean heavily compressed video files. Because the process of timelapsing takes numerous hours to do, finding ways to cut down the time used, both by you and the computer, is essential if you want to spent less time waiting and more time creating. Personally I am a big advocate for efficiency and constantly looking at ways to improve my various workflows, in both my video and photo work. A way I decide how to tackle each project is to plan around how I need the final output to look, whilst considering what my options are for capturing the footage. Finally, one big consideration to make is how 99% of the people watching your final video will likely be watching on their phone or a standard 1920x1080 computer monitor or television. Neither of these are likely to show all the colour information and resolution you can capture, so adding months of post-production to your project and terabytes of media for the 1% of viewers may not be worth the time; but this is entirely up to you. 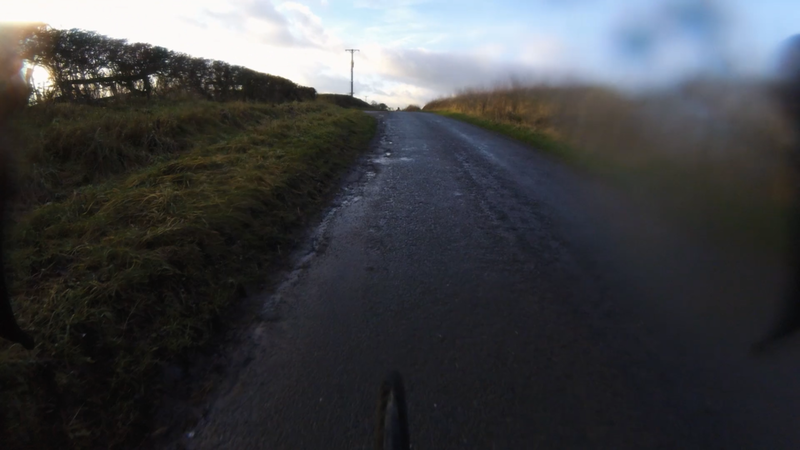 As an example, my Festive 500 vlog featured multiple timelapses, and as I needed the final video to be completed quickly, and the quality of the timelapses wasn't the basis of the film, I used GoPro video media (that I was capturing anyway) sped it up during the edit; finally adding a bit of motion blur to sell the effect. This was really quick, and took very little effort. On the opposite end of the scale I have now shot several timelapses for the ITV soap ‘Emmerdale’, and these timelapses needed to look the best they possibly could. Even though Emmerdale is displayed in only 1920x1080 on various qualities of television, and therefore not showing the best a timelapse can offer, the show does get upwards of 7 Million viewers daily, and consequently gave me an impressive platform to show my work. With the Emmerdale work requiring the highest quality, I shot on DSLR's, sometimes shooting with several at once; this was for options in the edit, but also incase of an accident. In preparation for a couple of the Emmerdale sunrise timelapses, I shot other sunrises in the days leading up to the shoot day, to give me an idea of the exposure settings I would need to aim for. Each of these was shot as 6K RAW photos, and often took days to complete in post production with several versions of colouring, motion smoothing effects, added digital movement, and sometimes even layering the shot with masks, to use various parts of the same video at different times for the greatest effect. In summary, both the Festive 500 vlog and the Emmerdale projects, were very different, and therefore handled very differently. You may often find you have to work within certain limitations, and the time allowed for a job is often the most important one to consider. If you are planning to shoot a timelapse, or several timelapses, i'd recommend you start off simple at first, and progress from there, as nailing down the basics are very important, and if you start too complex too soon, you can easily get bogged down in details and technicalities; as there is lots to consider. Perhaps try filming on your phone with a timelapse app first (the iPhone has one built into the camera app) and see what you think of that, and then decide whether you’d like to invest in it. From there, perhaps progress to using a camera as video and/or stills, and then progress further from there. When timelapsing you can often have lots of questions and considerations in your head at once. So it's helpful to prepare in advance: camera tests, recce-ing your location, inputing camera settings the night before, cleaning your gear, and trying to create a structure of sorts around your shoot; this all helps minimise your questions on the day. This is especially helpful for early sunrise shoots when any decision is slower than normal anyway. 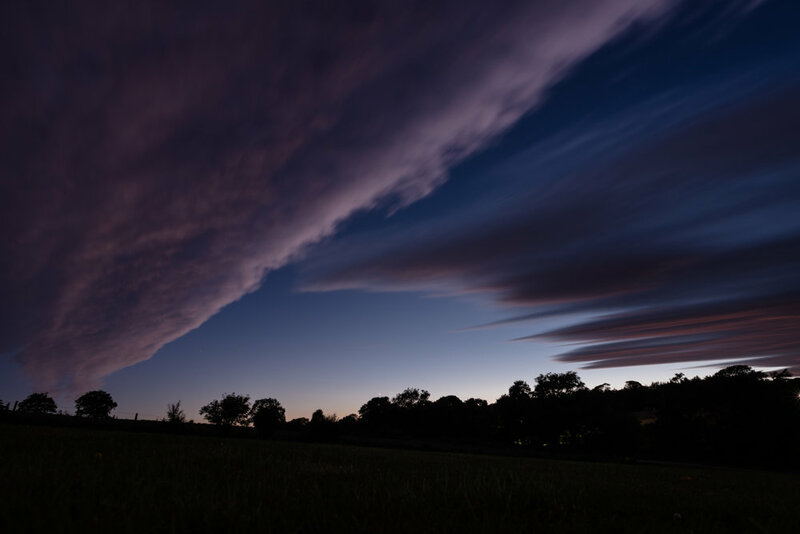 Below is a list of things to consider when shooting a timelapse. RAW gives the most control but is the largest and most unwieldy for beginners, video is the easiest but gives less control and quality, JPEG is the middle ground of each. Shooting video could likely limit your final video to Full HD (1920x1080), shooting stills can open you up to having 4K images, if not larger; for example my Nikon DSLRs produce 6K images as standard (6014x4014), but only shoot 1080p Video. Take time framing your shot perfectly, as any cropping later will limit your final output size. Also think about ratio, photos are usually 3x2, but video is shorter in height at 16x9 so the top and bottom of your photos will be cropped. Pay attention to what you're shooting, to judge the best composition and what will move in the frame, such as: clouds, water, traffic, the sun, pedestrians etc. Moving the camera during a shot adds professionalism and a whole different element, but does raise the price and complexity; i'd suggest leaving this until experienced with static shots. 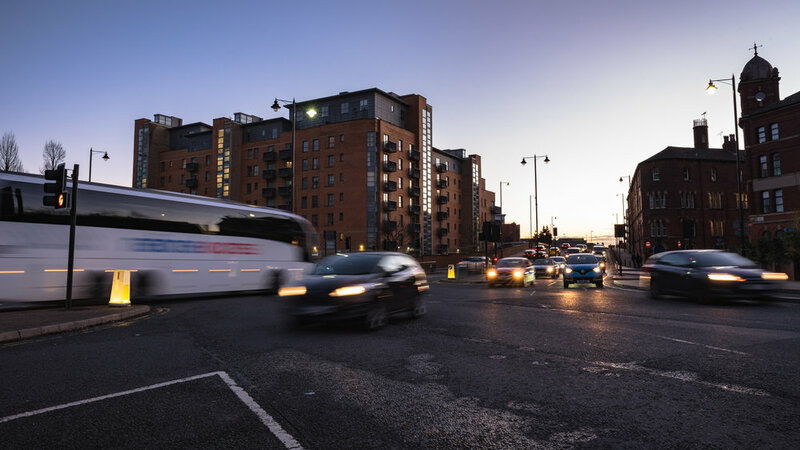 You could also try 'hyperlapsing' which involves moving the camera physically between shots (often on a tripod) to give the impression the camera is travelling, a great example of this was shot in Leeds by Thomas Williamson. This may sound over the top, but if you make too much movement near the camera when shooting, you may find wobble in the shot when it's finished. Also if it's cold, your breath could be captured too. If you’re shooting outside during the day, you will want to know the sun's direction and movement as this could alter your video; whether you want it to or not. Use a compass and smartphone apps to track the sun's movement: SunSurveyor and Photographer's Ephemeris are favourites of mine. I tend to use 64GB cards as standard for all work, which suffices for most shoots. If you use smaller cards and you shoot too many frames, your card could fill before you planned to finish. Try estimating the amount of shots you will take and how much space that will use; I use the estimate each RAW photo will be around 30MB. Your camera's buffer is very important when it comes to timelapses, it is crucial to the camera's ability of offloading a photograph from it's internal memory (the buffer) to the storage device you're using. 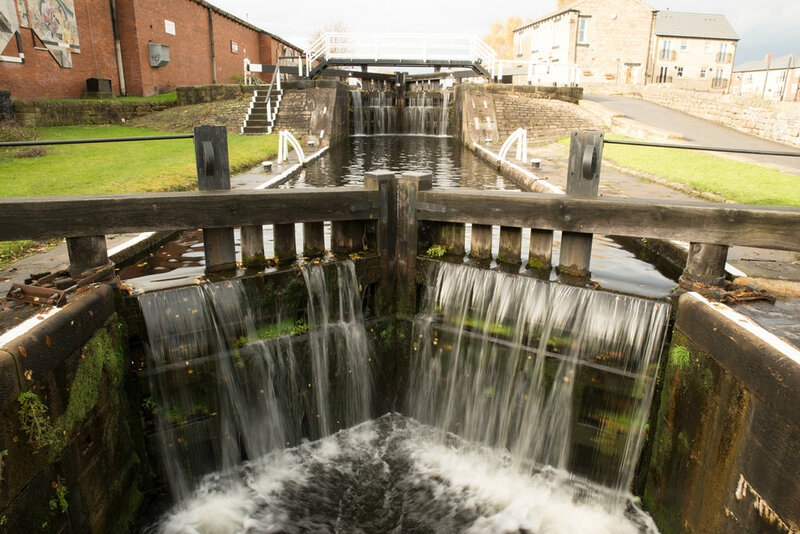 If you take photos too quickly the buffer will fill and not offload to the card quick enough, stopping your timelapse early. I’d recommend leaving the camera 1-2 seconds per image, this is especially important if shooting stars with long exposures of 25-30 seconds. If I shoot 25 second exposures I leave my interval at 30 seconds to give the camera 5 seconds to process the image and offload it. A longer shutter enables more blur, which is generally what you want, but too much can be distracting. Fast shutters will often look stuttery when converted to video (such as 1/50th, the standard for PAL television); however the light available may dictate your shutter to some degree. As a starter i'd recommend aiming for 1/10th or slower to give some motion blur. If your aperture is too low (f16-f22 for example) then dirt on the sensor/lens will be apparent, f8 is often recommended for landscapes. I often use f8 or f10 to ensure a deep focus; again the light available may dictate this. Auto settings only consider the individual image, not the sequence as a whole; this will always cause a lot of flicker in an image sequence as the settings jump up and down to adjust exposure for each frame. Also turn off any noise reduction within the camera, this will not only make your photos look worse but it will also mean each photo takes much longer to offload to the card. 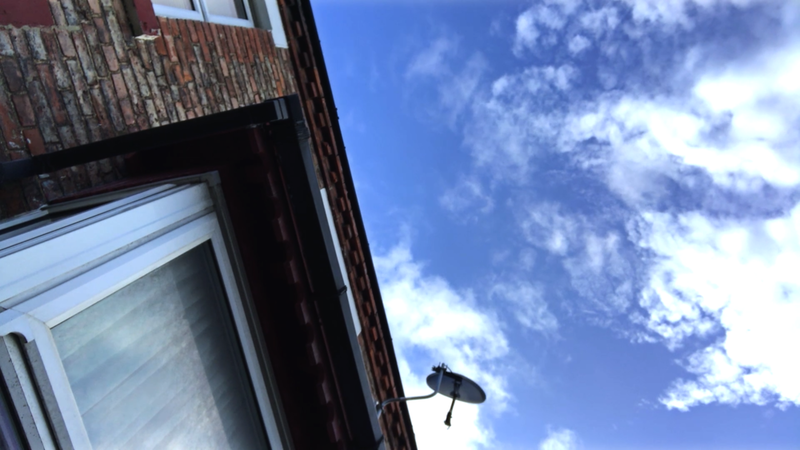 As with auto-camera settings, lens stabilisation only adjusts for each photo individually, not the the whole sequence, and will lead to a wobbly video as each photo will move slightly; i'm unsure how well on-sensor stabilising works in regards to this. Again, as with the other auto settings, auto-focus will adjust for each photo individually leading to your focus moving throughout your video. You can initially use auto-focus to focus your shot, but then ensure you turn it off before shooting the timelapse. Your camera needs to be mounted very solidly, or any drop/movement over time will be visible, bear in mind your tripod can also sink into any soft ground, such as grass. Any lightweight or flexible tripod could move or shift over time; it won’t be visible to you, but it will be visible in the end video. This is the time gap between images taken. Your shutter time is within this time and not stacked on top of this time; for example a 2 second shutter will fit within a 5 second interval, with 3 seconds to spare. If you use an interval too short, you'll potentially fill your card too quickly, due to the buffer not clearing fast enough. Too long and the video could look jumpy, or the 'event' will be very short. I often use 10 second intervals when shooting for a long period of time (several hours or longer) as this is a nice compromise between having too many images to work with in post, and having a sequence that is too short. If I am shooting for up to hour I often use a 5 second interval, which is around 720 images an hour; enough to show a change but not too many images to be slow to work with. The higher end of DSLR come with large batteries that will likely last a whole day of shooting, but it may be worth bringing a battery grip to extend it’s life. Better still, finding a way to connect to AC or DC power will allow you to shoot for days. Where possible, plan not to change batteries during a shoot as this will likely introduce a wobble, or even a change of framing if you're not careful. Be especially mindful when using mirrorless cameras as they have a tendency to use up batteries much quicker than DSLRs. When starting out, i’d suggest you avoid changing exposure settings during a timelapse as these can be hard to hide in post-production, especially big changes. If you do decide to adjust settings, you're best off doing it gradually, and allowing software such as LRTimelapse to smooth the changes out. If you can, avoid changing settings by hand, as you will likely incur a wobble or a subtle change of framing to the shot. You are safer using an external controller, such as those offered by Alpine Labs, Syrp, Arsenal and Kessler Crane; these can dial in settings to change gradually over time, giving an easier adjustment to fix in post. This is possibly the number one issue with timelapses, and can be caused by numerous things, such as: light reflections, short shutter speeds and something moving in front of the lens. Possibly the biggest cause is the alteration of camera settings between photographs. This happens due to a camera's inconsistency in settings between still images; even with a manual assigned aperture your camera will likely reset the iris blades after every photo and is never going to sit in exactly the same place. One way around this issue is to use a manual lens where the camera doesn't control the iris. Another way to circumvent this issue, if using Canon lenses, is to unlock the lens and twist it slightly off the body so the contact points don't connect. As a Canon lens is electronically controlled, the iris blades won’t move; but remember to not move the camera without attaching the lens properly again. This technique unfortunately doesn't work on Nikon lenses as the iris is controlled by a mechanical lever. If you plan to shoot a sunrise, or sunset timelapse, and not change the camera’s settings throughout, use the extreme capabilities of your camera sensor. For example don't expose like normal for the first shot, instead vastly under exposure before a sunrise (starting at -2 on the light meter has worked for me in the past), and overexpose on the first image for sunset (+1 on metering at the start). If you plan to shoot, and change settings to match the exposure over time, I’d suggest using an external controller and adjust your exposure accordingly, using the camera’s metering as a guide. I usually aim for slightly below the middle of the light meter when photographing anyway, so whenever the meter moves above the midway point, I adjust the exposure accordingly, using both ISO and/or shutter speed with each change. For example a sunrise I shot for Emmerdale started at ISO 6400 with an 8 second shutter, and finished at ISO 125 and a 1/5th exposure; with the aperture being at f8 for the whole three hour shoot; I also had a 4 stop ND filter on the lens. For both Holy Grail style shoots, I suggest you use weather reports, to know if the sun will even be shining at the time; then you will need to be aware of the sun’s placement. When planning your shoot, use the website 'The Photographers Ephemeris' and when on location, use an app such as 'Sun Surveyor'. Essentially you need to consider the entire time you are shooting for, and not just when the first frame is taken, like a single photograph. Also consider that in post you can't easily add changes to exposure, unless you apply these in a video editor, using keyframes and grading tools, or using software such as LRTimelapse, which is designed exclusively to work alongside Lightroom to allow keyframe changes to RAW images. LRTimelapse is also designed to reduce flicker in your image sequences, it's certainly worth the asking price of €120 / €300 if you want perfect timelapses. In this section I’ll be explaining exclusively about camera kit you may need to shoot a timelapse, whereas post-production kit will be discussed later in this blog. For shooting a timelapse, you can pretty use as much or as little as you want. You could use a smartphone balanced on a wall, or an entry level bridge camera on a cheap tripod, or you could have £50,000 worth of camera bodies, lenses and motion control; it's as dependent on your circumstances as much as it's dependent on what you're trying to achieve. Currently at the time of writing this (late 2018), I shoot on a pair of DSLRs, a Nikon D610 and D750. Attached to these are a variety of lenses, mostly the Tamron 24-70mm 2.8, Nikkor 50mm 1.4, Nikkor 85mm 1.8, and a Nikkor 20mm 2.8. 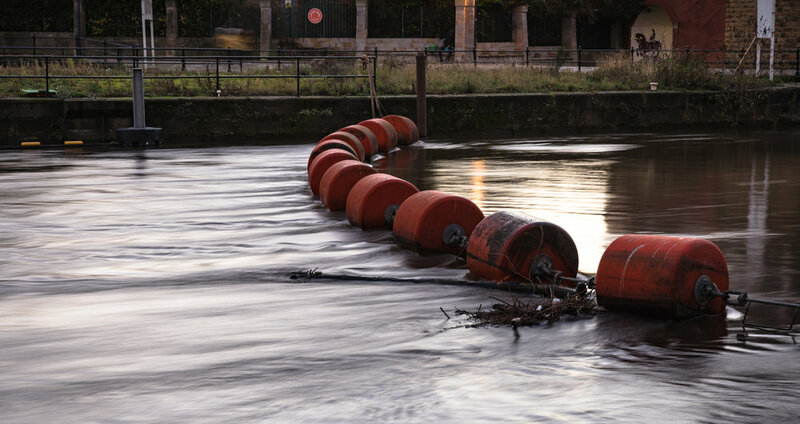 I also regularly use a couple of 4-stop ND filters to give me more flexibility with my exposure. The cameras are mounted on top of standard photo tripod's and controlled either by the internal intervelometer, or one of the external controllers I have; sometimes my Genie Mini comes into play if I require a panning shot. This setup is relatively simple and has seen me through timelapses for various projects in various conditions. But I do plan to add more motion to my work in the future, but it can come at a steep price. When I started shooting timelapses, I was using a Nikon D3100 and either the Nikon kit lens 'Nikkor 18-55mm', or one of the low cost Nikkor DX 35mm or 50mm lenses. In the last several years I have moved on with kit and stepped up bit by bit, mostly by trading in or selling equipment, to improve what I shoot with; buying pre-owned kit is also a great way to get better gear at a lower price. To shoot a still image sequence, you need any camera that will shoot stills and can be controlled by an intervalometer/controller. For example an iPhone is now able to do this with the addition of varying third party apps. With the sensor on a smartphone being very small (usually around a third of an inch) you will get reasonable results, but you could definitely achieve better results with a 'true camera' such as a DSLR or a Mirrorless. It's a good idea to take into consideration the resolution of the images you get from the camera you are using, for a couple of reasons. One reason is in regards to what frame size you want it to be viewed when you finish; photographs don't tend to match up with video sizes. For example the most common video sizes currently are either Full HD (1920x1080), or UHD (3840x2160), which are both in the ratio 16:9. But there's a good chance your photo camera will shoot much larger than this and in the ratio 3:2. Also consider that 4K footage is approximately 8 megapixels, which is relatively small for a stills camera these days; both my Nikons shoot 24 megapixels (6016x4016), and many cameras exceed 50 megapixels now. Some cameras will even do the merging of photos into video for you internally. For example the Nikon D750 has two Timelapse modes, one labelled 'Interval Timer' which is an intervalometer and triggers the camera to take up to 9999 photos in a row, storing the RAW or JPEGs on the SD card. The other mode is simply labelled 'Time-lapse Photography' and will create a video in Full HD (1920x1080), at the end of it's 'Shooting Time'. When starting to timelapse you will likely just be using a single tripod statically, and then potentially adding motion control with automated pans, tilts and tracking. A tripod will be your staple when it comes to camera support and these can come in various styles of weight, height and adjustability. For timelapse photography, you often want a tripod to offer the most stability, possibly even use one designed for video, as these are generally heavier and sturdier than photography tripods. I've found it is best to spread the legs of your tripod to give a wider perch on the floor. Also when raising the camera's height, extend the thickest legs first, rather than the bottom legs which will be thinner; both of these give better stability than putting it down in it's default position. 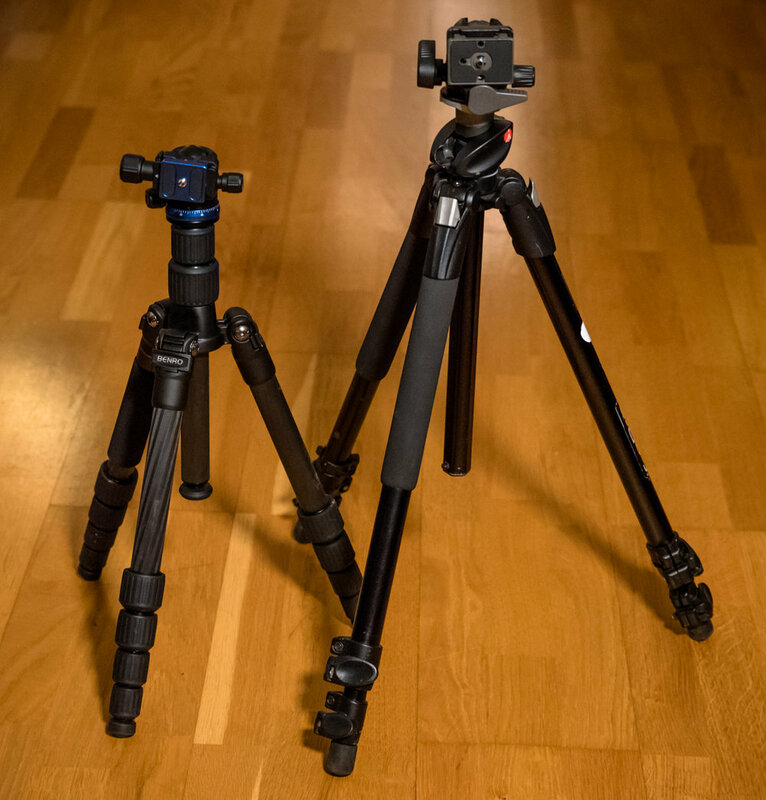 It can also be useful to use a tripod with a central column that can be used at an angle, such as the Manfrotto 190XPROB which can have the camera only a few inches from the ground with it's wide spreading legs and it's central column positioned horizontally. Other camera support options beyond tripods are available, such as a Gorillapod by Joby, which is a small and portable form of a tripod but with flexible legs made from ball-joints, giving you the ability to wrap the legs around items such as fences, poles and tree branches. I have used my Gorillapod a few times for timelapses, but noticed that during a long shoot the Gorillapod drops a little under the weight of the camera, and although this movement isn't too noticeable unless the videos is played very quickly; it is still there and could potentially be an issue at some point. When it comes to tripod heads, again stability is very important but unless your tripod head is very weak or broken, chances are it will hold still for long enough. I would recommend either using a ball head, or a video specific head as these will offer great support, and with a lot of flexibility. A ball head is my personal preference, as this allows every angle imaginable when trying to get the shot you want. Personally I use a combination of a couple of tripods, primarily my Manfrotto 190XPROB which raises to around 1.5metres tall and offers great stability and flexibility, but isn't too heavy to be carried into hard to reach places. It is regularly topped with the standard Manfrotto Ball-head. In 2017 I was looking for a lightweight secondary tripod and ended up with a travel version from Benro, which is extremely light as it's made from carbon fibre, so it is fantastic for travel and moving around, but can't get close to the ground, and can flex a little due to it’s low weight. To get very close to the ground easily, I got a Manfrotto 709B tripod which seems expensive for it’s size at £35 but it is super strong as it's made from steel, and holds a camera about 10cm from the ground. Finally, I do also have my Gorillapod but as mentioned above i've noticed a drop in it over time, so I don't choose to use this unless necessary. When choosing lenses for timelapsing, you have a few considerations to make, but fortunately you don't need to have the fastest glass when it comes to aperture, as you will likely be shooting at around f8 anyway; and practically any lens can do this. One consideration is whether to use a zoom lens or not, the big benefit of a zoom lens being you can change your focal length without moving, which is a big bonus if you are travelling with your kit, or have little room for movement if shooting in a small area. However a prime lens could arguably be better for consistency as the focal length can't be changed accidently, and primes are always better quality as the manufacturer doesn’t have to compromise on any part of the lens to allow the whole zoom range to work. Typically though, go with a zoom lens or you may get stuck with a shot that is tighter or wider than what you envisioned, and you may have to compromise your idea. I often shoot with my Tamron 24-70mm which has a switch to lock the lens to 24mm, for various reasons, but knowing I can be sure the focal length can't be changed is a comfort; especially when working in the dark on an early morning shoot. An intervalometer is possibly the most important part of your camera kit when timelapsing, unless you want to manually push the shutter button every few seconds, which would not only be impractical, it would also yield terribly wobbly results. External intervalometers come in various forms, with a basic one costing about £15. This will essentially tell the camera to trigger as often as you tell it to; external ones are also useful for triggering the camera manually from a distance, or for long-exposure photos when pressing the shutter can incur wobble. Over the years I have experimented with various intervalometers, with a cheap amazon purchase being my first one. These work well as they are simple and do what they say, but nothing fancy. I have also backed a couple of items on crowdfund websites, such as the 'Pico' by Mindarin, which claimed to be an easy solution for timelapse, and it sort of is. If you connect it to your camera and hold-press on it’s single button, it will beep repeatedly until you let go, how many beeps you hear is the interval between photographs until you disconnect the Pico. It did also have an app to control it via Bluetooth, but it appears to have been removed from the Apple App Store now; the app offered functionality such as changing exposure over time but from memory it didn't work too well. The 'Pulse' by Alpine Labs was another Kickstarter purchase of mine which has actually been very useful. Alpine Labs offer a variety of items, all via Kickstarter at first, and the Pulse offers full control of your camera over a Bluetooth connection to their App. It offers basic features such as taking a singe photo and a timer function. The timelapse mode is the most useful to me, and offers full control with interval, camera settings and one change in exposure settings at a time. My only gripe is that the exposure change is not via the clock, but just via time. Meaning if you are shooting a sunrise you can't tell it to start changing at 6:45am until 7:15am, you have to tell the pulse, 'start changing in 15 minutes over the course of 30 minutes'; this is workable but can be frustrating. However, a big plus of the Pulse is that the exposure change includes both shutter and ISO, which not every camera controller does. I have also now experimented with a Syrp Genie, which not only allows for motion control (either on a track or a pan motion) but also claims to control exposure. Personally I prefer the Pulse when it comes to just camera control as the Genie only changes ISO, and not shutter speed, which would be ok for small changes, but for a sunrise where you may be changing from ISO3200 and an 8 second shutter to ISO100 and a 1/5th shutter, not being able to control shutter isn't good enough. I do now also own Syrp’s Genie Mini, which is useful for panning or tiling your camera over the course of a timelapse, with it’s shoot-move-shoot function; but like the Genie, it only allows for exposure changes to ISO when shooting. There are also the offerings from Kessler Crane, which I believe were used for the House of Cards opening sequences and is essentially the Mecca of camera motion control. However it does cost thousands or tens of thousands to own, and requires a vehicle to manoeuvre, which I don't have. Rental is an option but could still run several hundred pounds for a day or two, and I currently have better things to spend several hundred pounds on. Lastly you have the potential that your camera has a simple intervalometer built-in. Both my Nikons have one internally, as mentioned before the D750 has one up to 9999 images, and the D610 has one for up to 999 images. If you don't plan a change in exposure these are good enough, I regularly use the internal ones over external controllers, just because it's simpler. When it comes to what storage you should use in your camera, it is very similar in requirements to when you consider recording video; essentially buy the fastest and the largest you can afford. Speed is essential as this allows the camera to offload media to the card from the buffer as fast as possible, and also speed up offloading media to your computer. Bigger cards are also useful as this allows you to shoot for longer without changing cards, the caveat of this is the same as video recording; you run a risk if your one card is lost or broken, you lose all the media, if it's split you only lose half. I'd still typically opt for shooting to one big card personally, as it's a tidier way to work in my opinion. You could incorporate a whole range of lens filters when shooting a timelapse, the most common and almost required, would be a ND (neutral density) filter, even a 4-stop (ND 1.2) would be enough to help reduce your aperture from f22, down to a more reasonable f10, which is nicer to work with and reduces the possibility of lens and sensor dirt being visible. 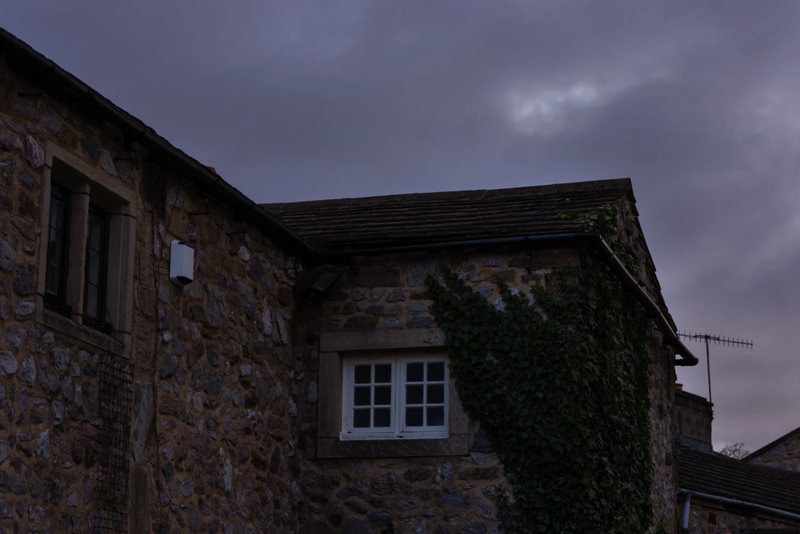 Another option is the use of graduated ND filters such as the 100mm set by LEE, COKIN or other manufacturers. This would allow you to reduce the exposure of the sky separately from the ground and vice versa, which definitely has it's advantages. A variable ND filter is useful to adjust exposure in various increments without changing filters, this could be used to adjust exposure, instead of changing your camera’s settings; as it is more discreet than a step-down or step-up change in shutter or aperture. Another option could be to use a polariser filter to heighten the colours in your shot. A polariser will also reduce reflections, which is especially useful if shooting through glass or water, such as shooting at a building when you don't want the reflections in the way. There are various other things you can bring for a timelapse shoot. Some things are useful for practical reasons, such as a chair to sit on, sandbags to weigh down tripods, a tent to sleep in (if working overnight), warm clothes; or alternatively sun screen and a hat if working in the sun for many hours. 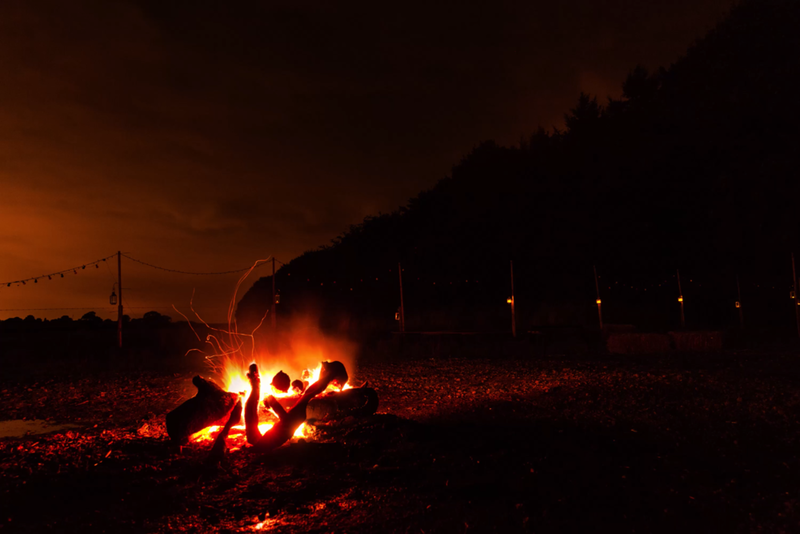 Other items to consider could be for creative reasons, such as lighting equipment to ensure certain areas of your shot are lit correctly, possibly even placing props in the shot (such as a second tent) to give your shot more life or character. You may find in time you have your own list of things to bring with you as you become more experienced, you'll quickly learn what not to forget, such as: something to read or listen to, food and drink, a waterproof jacket, extra batteries, a torch, or even an umbrella to cover yourself and the camera. During the last few years my chosen setup has changed numerous times, as I've changed kit, but also, as I've learnt. Ive mostly settled now on a couple of different setups, but plan to continue improving my kit as and when I can afford to; or when a project asks for certain requirements. 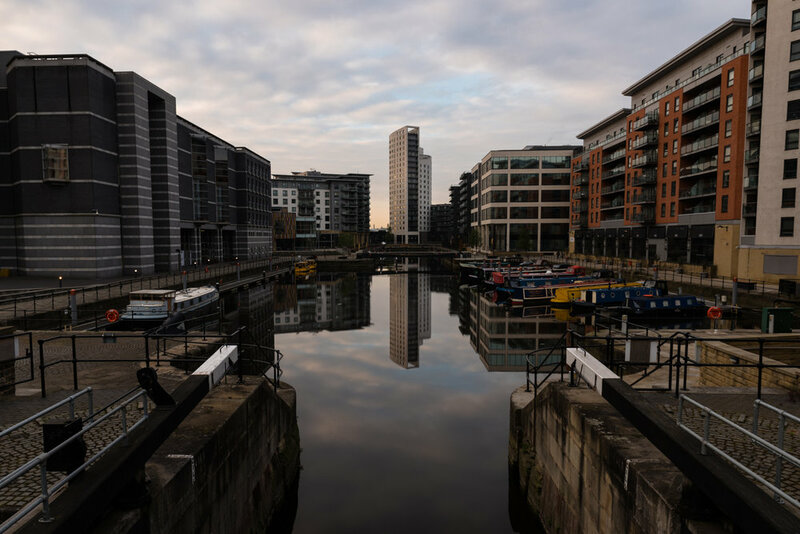 Whilst shooting most of my 'Five Years In Leeds' project I primarily used the Nikon D610 or the D750 with the Tamron 24-70mm and the Nikkor 85mm; the tilting screen on the D750 is helpful when low to the ground. However I do use other setups for specific shots, and sometimes shoot with both cameras at once, with a different focal length on each, so I could cut from a wide to a close up in the final film. Here are the details for the dual-setup I often use. This setup changes depending on the shoot, sometimes I'll use the Gorillapod instead of a tripod, but preferably not if using the 85mm lens; as the longer lens has more chance to show vibration and wobble from the Gorrilapod's flexibility. When shooting wide I often like to be low too, and both Manfrotto's can get down to around 10cm; and this short distance from the ground often requires the tilt-screen on the D750. I also often use the Internal intervalometer on both cameras, over an external controller as it's simpler and requires less setup. However the internal intervalometers can't change exposure, so if shooting a 'holy-grail' timelapse I need to use the Pulse, and the Pulse only works with the D610, not the D750; it’s a problem with the D750’s firmware not allowing third party input unfortunately. This then reduces my options, as the D610 has a fixed screen, making it hard to view the screen or viewfinder at low angles to judge composition and exposure. As you may be able to tell from this section, timelapsing can often be a game of compromise, decisions and choosing what is best for each scenario; hence why it's always best to plan, and test your gear ahead of time. This section will provide the steps involved in creating one or several timelapses, if using RAW images, and finishes off with a step by step guide for you to follow. There are also mentions of computer hardware and useful methods within the post process. The methods detailed below are basically what I do and has been refined over the last few years, and will likely change again in time. Once you have shot a timelapse sequence, you will need to post-produce it in some way. How you do that will depend on how it was shot, but also what the final product requires. If you are just shooting on your phone/tablet and posting to Instagram, then you don't need to leave that device. However if you plan to make a timelapse film, or include it in any other project that isn't entirely timelapse, it will need managing in a more professional manner. In this case you will likely spend several hours in post-production, there are already so many variables independently in each discipline involved: RAW photography, editing, colouring and video in general; so when you combine all these elements together, be prepared to potentially lose weeks, months or years of your life on a project. If you are shooting a timelapse film, you will likely have a staggering amount of data in comparison to a regular 1080p short film, or even a 4K feature film. 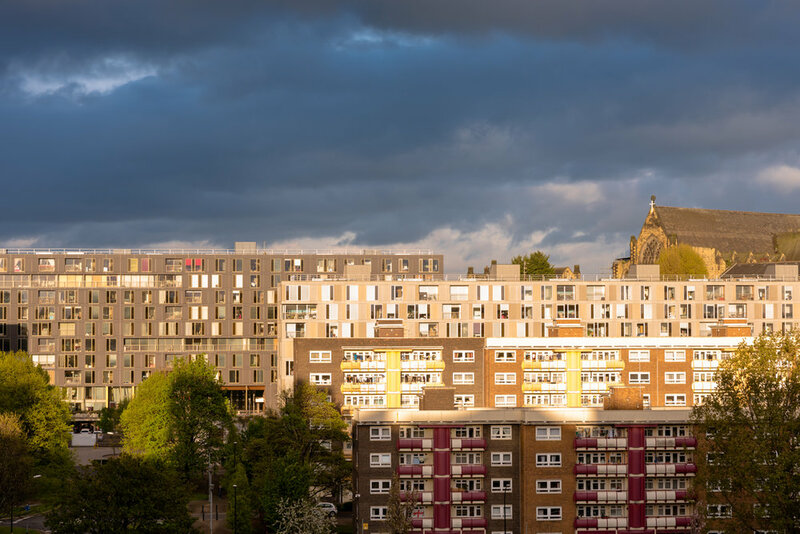 For example my 'Five Years In Leeds' project had over 59,000 photographs for 61 shots, this equated to over 1.65TB of data (3.3TB if you include the backup); this was followed by 800GB of ProRes media to edit with. RAW photos are always large files (my Nikon images are around 30MB each) and these can be a little slow to work with anyway. This is dependent somewhat on your hardware and software, but you may be editing 1000+ RAW photos in bulk at a time; so prepare to do a lot of waiting. Even with a high powered HP Z8 or Mac Pro you're going to be doing a lot of waiting for things to finish, as there is so much data to be read and written. One benefit however of RAW images, is how your picture editing works, RAW files are non-destructive so all your edits live in a sidecar file (called XMP data) meaning you never need to re-create your images when you edit, like you would with a JPEG. The other benefit of RAW is the amount of information you have to work with, your image likely has between 12-bit and 16-bit colour information, and this is fully utilised when editing in RAW, and only lost if you transcode the files to a lesser format. It is amazing what can be achieved with a 16-bit RAW photograph that at first glance appears to be of poor quality; holy grail timelapses rely greatly upon this information, I believe it would be near-impossible to get the same quality otherwise. 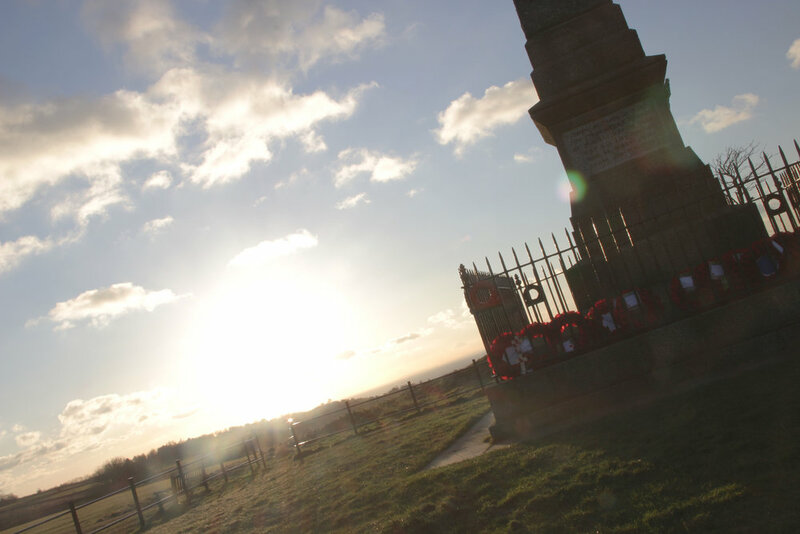 Once you have shot your timelapse you will need to copy and organise your images. I don't feel its necessary to use a checksum program (such as ShotPut Pro or Offload) to copy photographs, but if it makes you feel safer, feel free to. Personally I use a Parent folder for all my images for one project, followed by a child folder for each timelapse sequence with a title that includes the date and a description, e.g. 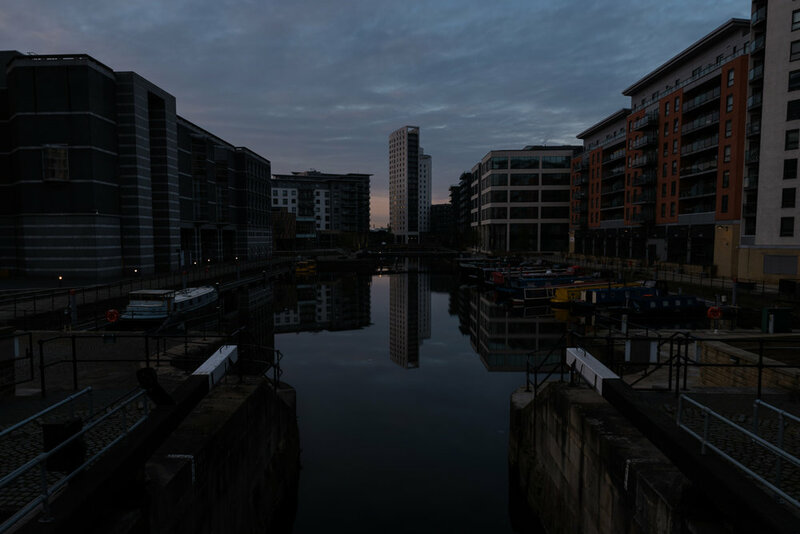 '17-10-11_Leeds_Dock_Sunrise'. This title tells me what date it was shot (date displayed in YYY-MM-DD to keep chronological order) and a brief description. After I have copied my images to this folder, I batch rename them in Adobe Bridge to have the same name as their parent folder, followed by a sequence number, e.g. 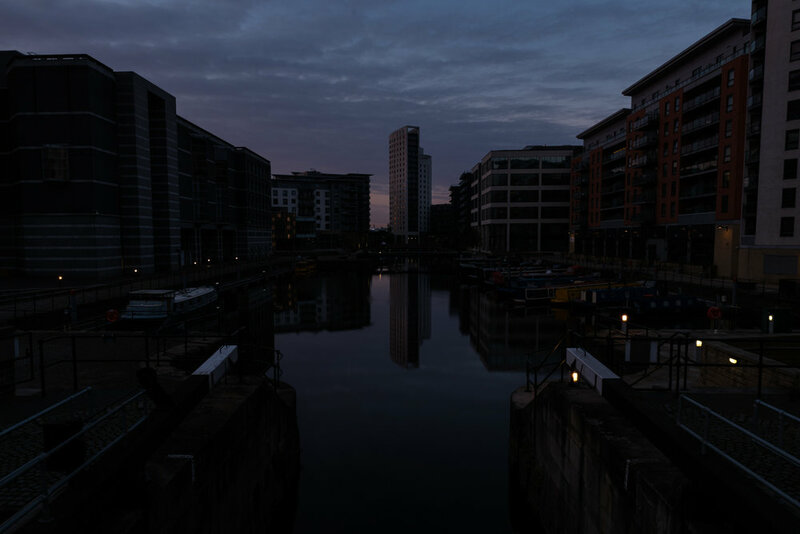 '17-10-11_Leeds_Dock_Sunrise-0001.NEF'. This prevents having many images with the same name of DSC_0001, and also means they retain a useful item name when imported into After Effects or an Non Linear Editor (NLE) such as Premiere Pro, Avid or Final Cut Pro. Tip: make sure to order your images by 'Creation Date' when ordering them in Adobe Bridge, as your sequence may have rolled past image DSC_9999 and restarted at DSC_0001. If you arranged them by name, the images will be out of the correct order. You will likely do this wrong a couple times, but you learn from it. As a note, Adobe Bridge also renames your XMP data if you rename the image files at a later date. As a way to organise my workflow sequentially, I use a number at the beginning of folder structures (for all projects, not just timelapses). For example my original RAW photos will be under '01 Images', but the preview files of these will be '01.1 Previews'. I haven't rolled over to '02 Previews' as the preview files are part of the same step. I would then use '02 ProRes Exports' for when I have exported the images as ProRes media, as this is a next full step in the workflow. Once you have copied your images, you will likely want to watch them to get an idea of what your shot looks like. You can't play the image sequence in a video player, due to the bitrate of RAW images. Up until 2017 I would make a low-resolution H264 file in After Effects, with burnt in timecode using frame numbers (so I could frame accurately locate errors). But now I have a license of LRTimelapse, I create preview files in there; but they are only temporarily cached, and therefore lost when the application is shut and they are not viewable on other devices. If I still wanted to watch the preview elsewhere (such as on my phone) I follow the steps below. Hint: The timecode generator will start at 'frame 0' by default when using frames as it's time-base, change this to 1, or else your frame's won't match. Hint: The keyframe distance is very important with time-lapse previews as the videos changes are often so abrupt, if the distance is too long, the video will be lower in quality. The average for normal video is every 3 seconds, but I make this every 1 second for timelapse previews. When colouring your timelapses you have many options of how you would like to do this, however the process is initially limited by how you shoot (RAW, JPEG or video) and then how you choose to process and edit the media. 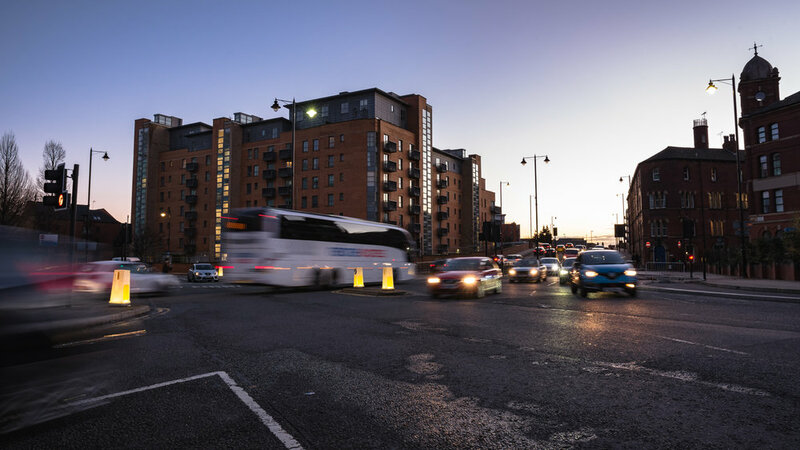 The ultimate way, in terms of flexibility and keeping colour detail, would be to shoot RAW photographs and colour with a combination of Lightroom, LRTimelapse, and finally any last minute adjustments to your video media when you reach the online edit. If you do not own LRTimelapse then I'd suggest editing in Lightroom first and adding any additional adjustments (such as keyframe exposure changes) at the video edit stage of your film. When I used this technique, I would edit the images with identical adjustments across them all to keep it 'even', with the intent on adding keyframed changes in the video edit. Holy-grail timelapses are problematic with this style, as the changes in exposure are so vast you can damage one end, by adjusting too far for the other end; which is obviously a huge compromise. I now follow the LRTimelapse method which can involve lots of back and forth with Lightroom and LRTimelapse, changing various settings, and seeing it's effects over the whole sequence. You would then use LRTimelapse to remove flicker; this method is far superior, but is also very time consuming. The huge benefit of this method is the ability to change exposure when shooting, and then being able to hide these changes in post, which enables you to capture images in a way that is only available to timelapse. I'm not going to explain how to use LRTimelapse as the creator Gunther has many tutorials and explanations of how to use it, which are much better and with far more understanding than anything I can type up here. But I would advise you stay away from using the ‘Dehaze’ slider for now. Your style of editing will likely differ greatly from my editing style, and from anyone else's style, as it's all down your own taste. Personally I like contrasty images, and tend to push my blacks as far down as I can without going 'sub-black’. I do sometimes experiment with 'milky blacks' but I tend to only do this in single photographs, black and white wedding images, and when trying to emulate film, or on Instagram. 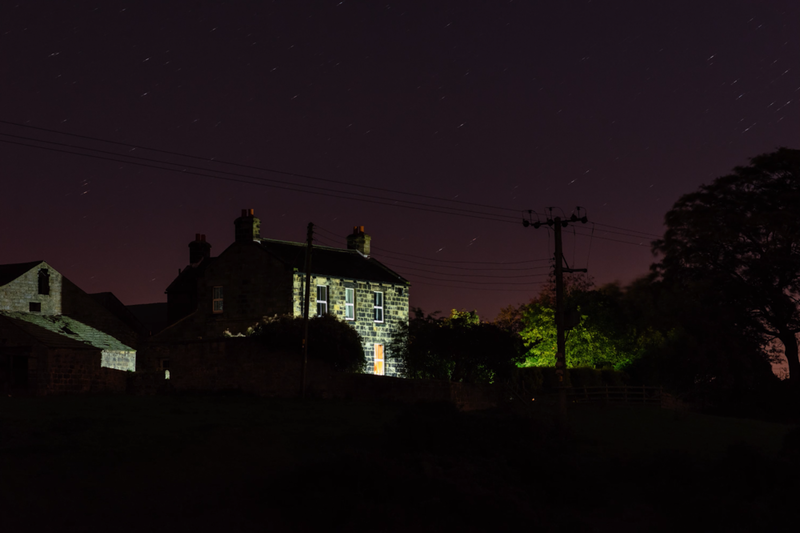 So in that regard I won't detail to you how I like to colour my timelapses, as it is all personal preference. I would advise that you revisit your images after editing them the first time, as you may feel differently on the second viewing and want to change them. 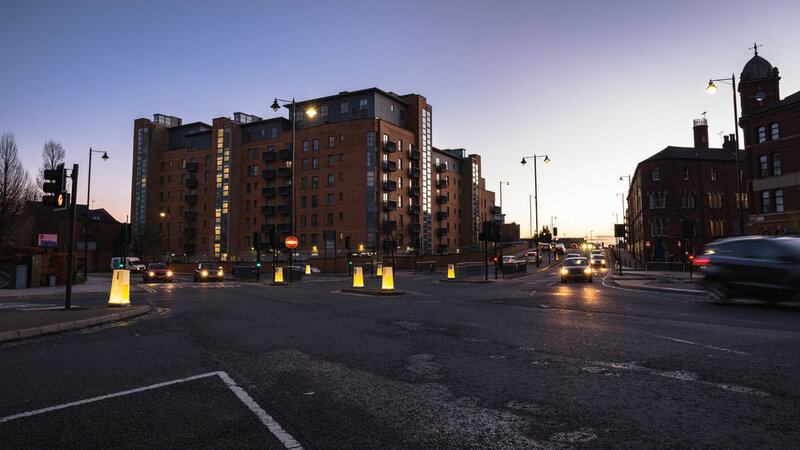 Personally it took me three rounds of editing my project ‘Five Years In Leeds’ as my taste changed over the time I worked on it, and as my understanding developed of the tools I used. I also added some changes once I was editing the film, some were for benefit of the film’s story (showing Leeds from Sunrise to Sunset) and some were because I thought the shot looked better with a certain adjustment. I'd also advise you think of your timelapses as different to regular film or photos, and to go further than you normally would. You are essentially capturing something on a different time scale than we can normally comprehend and therefore can get away with going further than your imagery normally does; embrace that. Once your photos have been edited, you will likely convert them into a video format for greater ease in editing; unless you want to edit with RAW image sequences. The way I do this is to use After Effects, in a similar way to how I create Preview files (see above) but with a different output setting. For this I choose to export in ProRes 4444, to be confident i'm not losing any colour information. Even though all ProRes format's are designed to retain whatever bit depth you input (with only a restriction in bandwidth) and ProRes 422 HQ should be adequate, I'd rather choose the highest version available to me, to be sure. If you can export ProRes 4444 XQ then I'd go for that, as it has an even higher colour accuracy; which ProRes famously can be a little bad at sometimes - Larry Jordan has a page on his site about ProRes 4444 XQ. For anyone unable to export ProRes, such as PC users, I'd recommend using one of the DNxHD codecs at their top quality, such as DNxHR 444 which is designed for 12-Bit cinema quality images. Also I hear the GoPro Cineform codec is very good and having looked, it does have an 'RGB 12-Bit' codec option, which would work perfectly well. Be prepared for some serious wait times on your exports, if you have a high resolution image. I generally wait for 1-2 hours for each one of mine to leave After Effects at this step. My average image sequence is 6016x4016 (when un-cropped) and around 1000 frames in length. If you have 10, or even 50 sequences to export; prepare for a few days of watching a progress bar. Once I have a video version of my timelapse, I then reimport it into After Effects for additional de-flicker/smoothing. The various techniques in After Effects essentially means layering the video on top of itself, with a slight delay and different transparency in the image, to smooth out minor exposure alterations between frames; but there are various ways you can do this. When I didn't have LRTimelapse I used the method below exclusively, and experimented with different ways depending on the content of the timelapse. N ow I use a combination of LRTimelapse and After Effects. There is a really good tutorial on removing flicker or 'The Staccato Effect' from your timelapses using After Effects, by Preston Kanak. It's a brilliant explaination of the different methods he uses to remove flicker from timelapses by just using After Effects. I used this as a base for my own projects when starting to look into timelapse, and have adapted his methods for my own use. I don't often use Preston Kanak's method of many many layers of video with different opacitys but I do use a similar method when i'm stuck. I regularly use the 'Echo' filter with the 'Number of Echos' at 10, the 'Decay' at 0.25, and the 'Operator' to Maximum. As a quick and dirty method I find this alone helps massively in reducing flicker if you don't have time to experiment. If a video is still flickery I will duplicate the video layer twice (total of 3 layers) and have the 'Echo' filter on the top and bottom layers, and the ''CC Wide Time' filter on the middle layer, with it set to '2 Frames Forward' and '0 Frames Backwards'; layers 2 and 3 would then be set to 50% opacity to be visible, and therefore blending all three together. The hardware you'll need for timelapsing will vary on the project, a smartphone is capable of creating one internally, and most computers built in the last few years will be able to create a JPEG timelapse sequence to some degree, but it could take a few hours. As for RAW timelapses, you may want to think about higher spec hardware to save yourself days of time; but that obviously costs. Personally I am running a top spec Late 2015 27" iMac, which houses a 4Ghz i7 Processor, 4GB Graphics Card, 24GB RAM, 512GB Flash Drive and is running it’s media from a 4TB GTechnology USB3 drive. My setup isn't cheap in comparison to a basic PC laptop, but isn't especially expensive in the world of post production; a high end HP Z8 or Mac Pro can easily cost three or four times this amount. For an example of computer costs, The Slow Mo Guys released a video in 2017 where they installed $8000 worth of upgrades into the PC they use for editing. You often find video processing is one of the most intensive tasks you can ask of a computer, especially when that task involves higher than average amounts of data: timelapse, slow motion, HDR, RAW codecs, 4k and above, etc. Spending money to help cut your edit time down, is always helpful, but it can come at a high price. I highly recommend understanding the machine you use, and what it's capabilities are. For example my blogpost on how I made the 'Twelfth Night on Tour' documentary, includes how it was cut on an ageing iMac, but it was a machine I understood through and through, and knew how to get the best results from it. If you do require more power than you have, then a new machine may be what you require. But there's always the chance you may get away with just some upgrades at first to decide if this form of video is something you enjoy doing. Upgrades such as more RAM and an SSD as your boot drive can make vast improvements to speed and stability. Also running your media from a fast external hard drive or RAID setup is definitely a help, and a USB3 connection is perfect for most tasks; or if you want even faster you could use Thunderbolt. Most of my workflow has been scattered in this blogpost so far but I thought i'd also put it down in a consolidated list, so it was easier to understand, rather than you having to piece it together yourself from various sections. This is a generic way I create a timelapse from start to finish, it won't be the ideal method for everyone, but it may be a starting point some of you could use and then adapt to suit your own needs. Export a new de-flickered ProRes 4444 file. If you are intending on editing your timelapses into a film then any of the main Non Linear Editors will be able to do this for you. 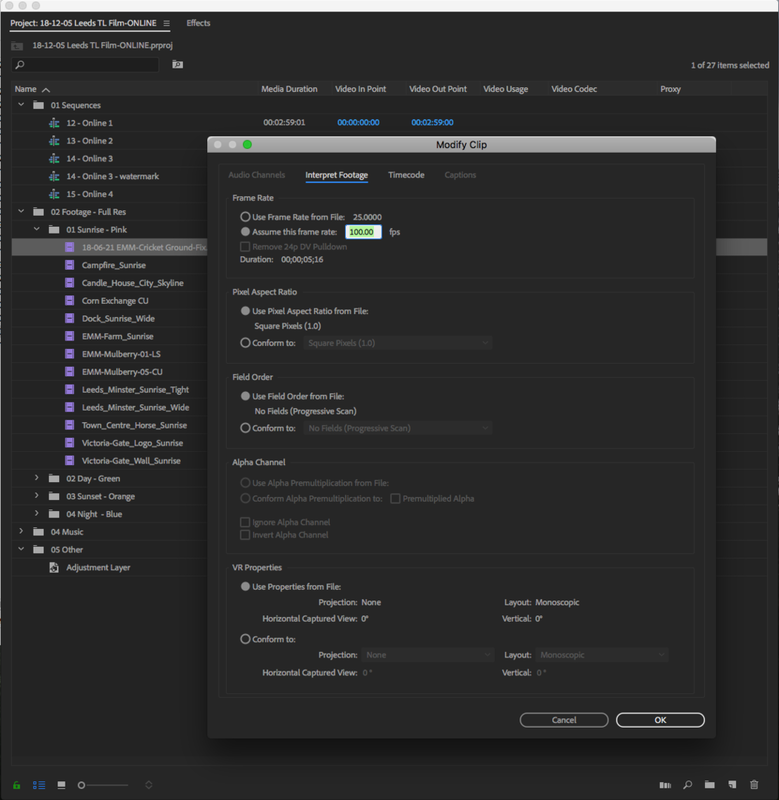 I’d argue that Premiere or Final Cut Pro X would be the best to choose from, as Avid isn’t very flexible with how it handles resizes, and mixed media timelines. I’ve also found Avid tends to soften images upon render, and I wouldn’t want to risk that. Choosing how you want to master your final output can dictate how you manage your project and is entirely up to you. I’d argue that you should aim for the highest you can, and if you shot your timelapses with photos, you’ll likely be able to master in 4K, or higher. However, if you are working on low spec hardware then perhaps a 1920x1080 master is more suitable for your project; it would be hard for me to tell you what to do without knowing all the details. To help with your editing I’ll detail out how I cut my project. 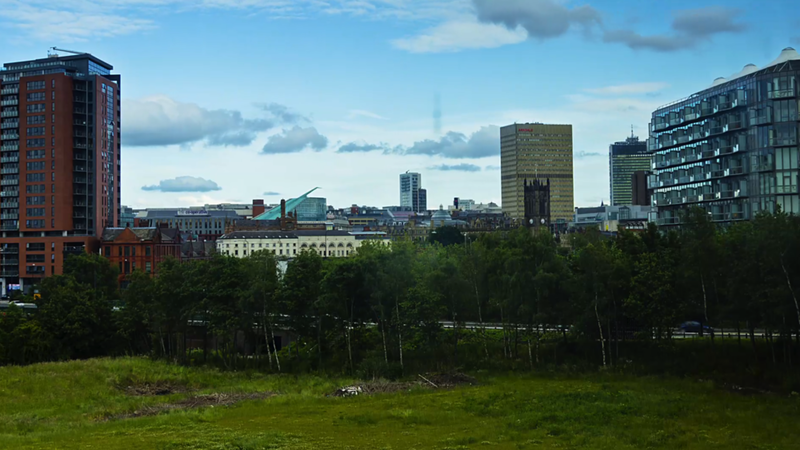 The intended edit of my Leeds timelapse videos was to portray a day in Leeds, but with footage from the five years I've lived there, and will hopefully show areas and viewpoints of the city that people haven't seen before, but also with iconic buildings and views that people will recognise. To accomplish this edit I cut in Adobe Premiere Pro on my iMac using the final ProRes 4444 videos I had, and mastered in 4K. The media I used was between 5k and 6k, giving me room to crop and add movement without loss in resolution. I would have been very tempted to cut in Final Cut Pro X if I owned it, as it has a very dynamic and simple way to adjust the timescale of media. This tool would be have been very useful for this project; perhaps I'll purchase it for future timelapse films. FCPX would also have given me the most power out of my iMac, as it is designed to use every percentage of power my machine has, whereas Premiere isn't quite as refined and doesn't fully utilise my GPU; but I was working with what I owned. If I had been planning to Master in only 1080, I would look at reducing my file sizes down from 6k, to something smaller such as 4k or even 3k to reduce the data rates required. 3k and 4k are still large files but with over 60 videos, the accumulative file size reduction could be several hundred gigabytes. 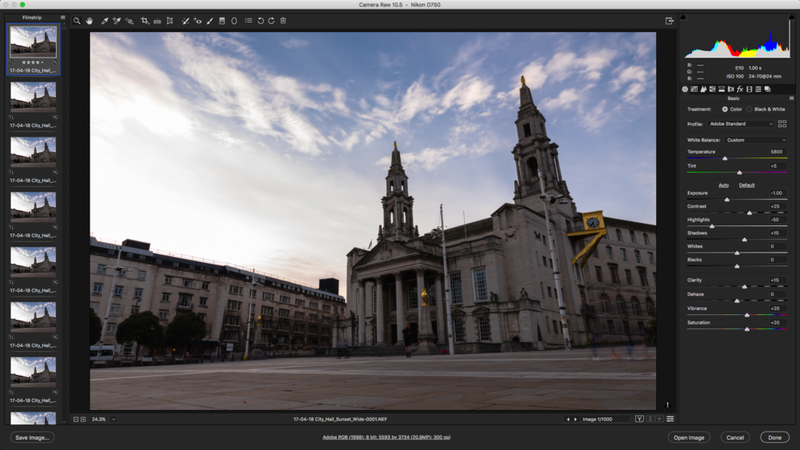 For my edit, I initially created ProRes Proxy versions of my timelapses to make editing faster. They had the same dimensions and names as my original videos so re-linking wouldn’t cause any issues with effects and resizing, but the lower bit-rate of ProRes Proxy lead to faster renders and a more responsive edit. I did still struggle at times with playback, and Premiere often believed I didn’t have to render my sequence, presumably as the spec of the files and sequence matched; to circumvent this I placed an adjustment layer above them all with 1% contrast applied to force a render. Another thing I did with my media was to re-time it all to 100fps. This meant the frames played per second matched the percentage, meaning it was much simpler working out what frame rate a shot was: 100fps was 100%, 200fps was 200%, 25fps was 25% etc. This made things easier to keep track of, and ensured a shot never played below it’s native of 25fps, which would have lead to Premiere having to interpolate frames; I also stuck to changing the speed of each shot in 25% increments for the same reason. The edit of my timelapse film took a couple of weeks, mostly because I was doing it at evenings and weekends around my full time job. But also because I kept doing a section of it, then giving myself a day or two, to think over what I’d done, so I came back with fresh eyes each time. Because this film was a passion project for myself and had no official deadline, I wanted it to be perfect with no room for changes in the future. And for those reasons I gave myself time to gestate over the decisions I was making. With each part of the film cut, I would upload a version to dropbox in 720p quality so I could watch it on the go, giving me a different perspective than watching it in full res on the iMac. Once I had a full edit done, I shared it with numerous friends, family and colleagues to get their perspective on it too; if anything stood out to them, or a part of it seemed wrong, or it didn’t make sense etc. And with the bits of feedback I got, there was a couple of changes to the final film but overall the feedback was largely positive. Once I’d got through this feedback period, my original plan was to add sound effects. These sound effects were to help each shot’s atmosphere, such as traffic noise on the inner-city shots, and wildlife sounds for the countryside shots. After an evening of testing this out I decided against the whole thing as the mix of music and sound effects just didn’t work as well as i’d hoped it would. Perhaps if i’d planned the soundscape from the start, it could have worked, but the film would need a gentler soundtrack and to be cut much slower, and in a different order, for the changes in sound to not be jarring to the viewer. I’ll consider this for a future project though, as I still like the idea. As I completed the edit I then duplicated the project to a new ‘Online’ version where I re-linked my full res media; I did this by deleting the proxy media and re-linking each shot to the ProRes 4444 media manually. This meant I could scrap anything in the project that I hadn’t used, such as the SFX files, shots that weren’t in the edit, and sequence versions. I’ve found in the past that making an ‘Online Project’ once you’ve locked your edit, speeds up saving the project, and can lead to less crashes. Within the online project, I applied the final touches to the film, including: opening and end titles, the fade in and out for the music, any last minute colour tweaks (using Magic Bullet Looks or Colorista), and finally several quality control viewings on different screens to spot any issues. One issue I spotted once I could watch it in full 4k resolution on a large TV, was that two shots were a little softer than the others; one had been shot through a glass panel, so that was expected, and the other had been shot in cropped mode in the camera, so was a slightly lower resolution to the other shots. Both of these were digitally sharpened enough to tighten them up a little, but not so much as to look artificial. One other thing I noticed when watching it on a large screen, a 55” LCD television, was how the digital moves added to many shots looked to be less dramatic than I had previously thought. I think this is likely due to when the moves were originally added, the film was being played in the Program Monitor within Premiere, and the motion looked much more dramatic than when it was stretched over a larger space. This lead to me pushing many of the moves further than previously, and I think the film benefits from it. Lastly as this film contains a number of effects, including colour, motion, transitions and one has the Echo filter applied again. This lead to needing to manage those filters intelligently so they didn’t interfere with each other. For example there is a number of shots where I’ve transitioned in the middle of them with a ‘Film Dissolve’, meaning you can’t use the standard motion effects to add a move to the shot, instead you need to use the ‘Transform’ effect on an adjustment layer. Also there are a few shots where I’ve accentuated the shot’s change in colour, for example, adding more orange to one half and more blue to the other, then fading between them. This adds the same complexity when it comes to adding a move, so you end up with two adjustment layers: one with the colour faded between them and the second with the shot’s move applied to it. Finally in terms of adjustment layers, all the images had a layer above them (with the text layers above that) with a filter on as part of Magic Bullet’s Looks tool. The filter is called ‘Pop’ and adds contrast to edges, and essentially adds a very intelligent sharpening, that looks more natural than an ‘un-sharpen mask’ does; it just adds to the render time massively. Each project has it’s own requirements when it comes to the final export. This will vary wildly depending on the final requirements, such as: Cinema which will require a DCP, TV will likely be a a broadcast format such as ProRes, DNxHD or AVCi100, DVD will require an MPEG2/AC3 file duo, and an Online Player will likely be an H264 file, or H265 if they have modernised. Personally I always export a full resolution version in ProRes, for future use, and then create other versions I need, such as an H264 file for YouTube. For the master copy of my timelapse film I exported a few versions, partially for future proofing the project, incase of any changes I would want or need to make later on. You could argue that I should keep all the media and the project available to me for any possibility, but that’s just not going to happen as it will be several hundred gigabytes and not worth it to me. One option is to consolidate the project and only include the final sequences with some footage handles, which would allow for changes in the future, but with much less unnecessary footage; however I’ve not often had much luck with this option in Premiere, finding it just doesn’t do a good job. With some projects, I would do a WAV export with no music involved, to maintain clean dialogue and the ability to change music at a later date, but as this film only contains music this would be pointless. On top of these versions of the film for delivery and archiving, I will also be delivering a version of each timelapse in 4K (4096x2304) in ProRes 422HQ, to these stock websites: Pond5, Shutterstock, Adobe Stock, and VideoBlocks. During this project I have learnt a lot through the hundreds of hours I’ve spent doing it, mostly experimenting with what I wanted to try; and experiencing what would, and wouldn’t work. I have quite often been underwhelmed by the shot, either due to boring weather or a mistake i’ve made, and it ends up being deleted, often in camera, which forces me to try again. But every now and then, a shot is completed as I envisioned it, or better, and I am blown away by what is possible. I didn’t start this project believing it would lead to having work displayed to millions of viewers on ITV. But I believe the best outcome of that was the opportunity to timelapse in a professional environment, with the pressure of an end goal pushing me beyond my limits at the time - I don’t think I would have gone through with a sunset to sunrise timelapse in a Yorkshire field without a need to do so. I’d like to think in time I will produce a film to the level of Tom Lowes ‘Timescapes’, but that will require much more equipment, cost and experience. Perhaps one day I’ll rent the required kit for a week and go explore a new part of the UK, or a whole new country entirely. However I may take a break from timelapsing right now, and focus on something else for a bit, such as product photography. I hope that reading this guide has helped you learn something about timelapse, and will assist in your learning process if you attempt to create your own singular timelapse, project or film. Finally, if you have any questions, or would like to share your own work, please do contact me on the comments here or on social media.